And here we go! ds106 is off the ground with week 1’s assignment, a post with typical Groomian oomph (‘this ain;t like your mama’s MOOC”). We are to do any kind of short story about something that happened recently. I was toying with some tech and came up with a half baked idea to try, but before the “making of” extras, let’s watch the feature, in which I have a conversation about why on my recent glorious trip to Hawaii, I managed to avoid taking any photos of the wild chickens. Okay, I broke the first rule and went over, it is 3 minutes wrong. Sue me. See, the rules in ds106 are to make your own! I was reading somewhere earlier that Apple has a version of Facetime that you can use on your desktop to do Facetime calls to an iPhone or another person with the app. It’s the thing so an iPhone hating thug can join the Facetime fun. I the software, and lacking any real friends, I did the logical thing- and called my own iPhone from my laptop. Having just read the assignment, I began to wonder if I could use some screen recording software on my laptop to record a conversation with myself (I decided to use a stuffed dog in front of the camera on the laptop, and I would go in the other room). I thought about how to do two voices, and decided I would use the screen recorder to record the sound of my voice coming through the app, and I would leave blank spots in between to later insert the “voice” of the stuffed animal. Being such a thorough planner (e.g. 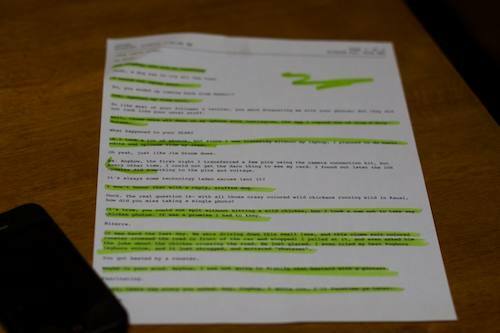 not feeling I could improv the whole thing), I typed out the script, and highlighted “my” lines I would use on the iPhone side. The other ones I would just leave long enough pauses to insert the other voice. The software I used to screen record is iShowU — any would do. I made a black JPG to put behind the window of the facetime app, and used the screen capture size in iShowU to set the area to record. I set it to record system sound only. I wanted to capture the calling part, so I had to reach in from the side keeping my hand off camera- then I had to scramble back to my office to pick up the phone (there is a blooper- you can see me walking away on the right side of the screen). (and yes I know I flashed my phone numbers, who cares? there’s no real privacy anyhow). It worked pretty well, except as I was facetiming on the phone, I could see I was getting overhead glare from my light, but just wiggled the phone around. I had to say the “other” lines in my head to leave space (my hope was to do it without video cuts), and try to look like I was listening to the other person. I was pleased to do it in one take. I then sat down, and recorded the other set of lines- I did not worry about the spacing as I knew I’d cut them up in editing. I could have use Audacity to record, but I just did them with Griffin iTalk on the iPhone. 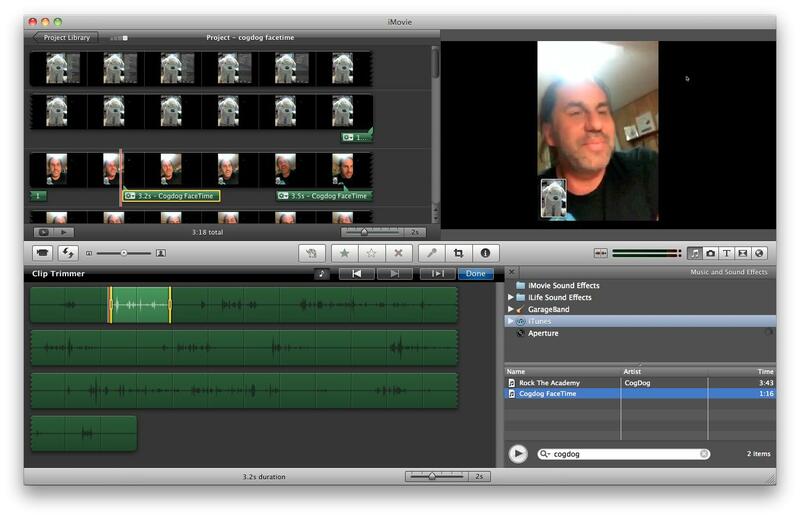 Then I brought the video into iMovie, and set the main track out. For the recorded audio, I tossed it into iTunes, which I could then access in iMovie. It was a simple edit, I exported, and uploaded to YouTube. It turned out to be fun to script and record a conversation with yourself. You can easily give yourself a lot of smack. This might be the last time I do my assignment this early- I just got inspired to try and make it work. You’re a one-take wonder, CogDog! Way to go with this, fella. It takes guts, and a wee little bit of insanity, to put yourself out there with something like this. Well done. Show off. Why you gotta set the bar so high before we even start? Pingback: Timmmmyboy » ds106, an introduction. This CogDog character pwned you – he should get his own show.